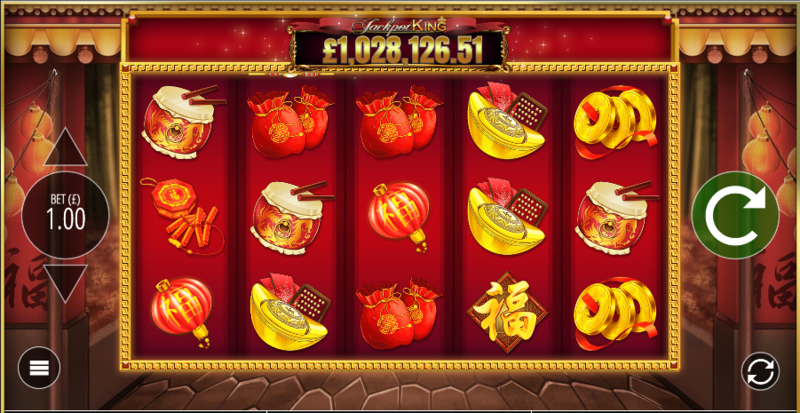 Music reminiscent of a Chinese restaurant and and some very familiar eastern symbols can only mean one thing – that’s right, it’s an online slot with an oriental theme and this one’s called Lion Festival; it’s developed by Blueprint Gaming and it comes with an interesting free spins round plus the Jackpot King progressive jackpot. 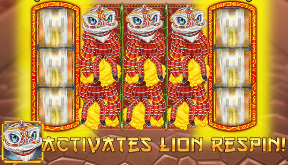 Lion Festival is a five reel slot with three rows and ten fixed paylines although those lines pay from right to left as well as left to right, effectively doubling the number; the reels spin with an ornate golden frame which sits against a backdrop of a traditional Chinese building. You’ve probably seen most of the symbols in other games of this genre and they include a young girl, some Chinese coins, a paper lantern, a drum, some script, a gold ingot, red money bags and some firecrackers. The lion mask is the wild symbol and it will substitute for all others to form winning combos; there’s also a little Maneki Neko cat whose purpose is explained below. 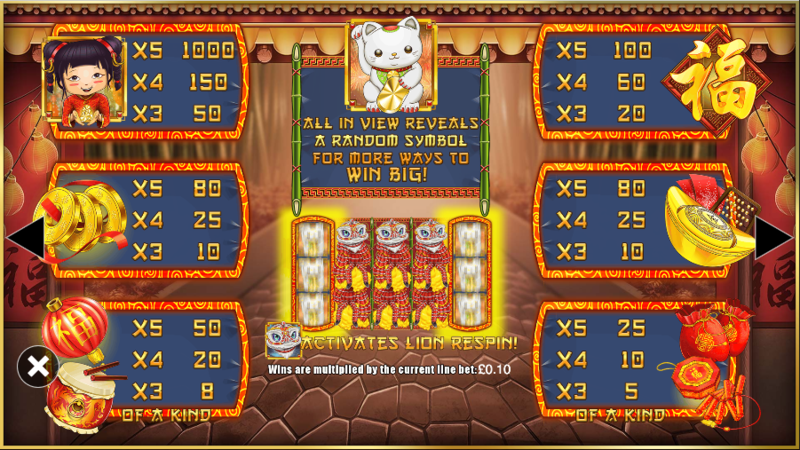 This is triggered by landing at least one lion mask anywhere on reels two, three or four; that lion (or lions) will now expand to cover all positions on that reel and you’ll get one free respin. If a lion lands during the respin the process will occur again and this can continue until reels two, three and four are full of wild lions. Any lucky cats which appear on the reels will transform into a random symbol, hopefully helping you out with some bigger wins. Super Spinner is connected to Blueprint’s Jackpot King progressive jackpot network and to trigger it you will need to land five of the Jackpot King symbols on reels one to five. You now get to spin a separate set of reels to collect crowns to work your way up the ladder (15 means you make it to the Wheel King). Spinning the Wheel will award a large bet multiplier or the progressive jackpot. Send you straight to the Wheel King. End the round and award the prize collected so far. Lion Festival is a decent addition to the lengthy ranks of oriental slots already out there; it probably won’t make our top five because of it’s lowish RTP of 92.48% but it’s worth checking out if you want something new.